There’s always a bit of extra reflection you can’t include in the discussion of a research paper. Dr Alan Garner reflects more on some of the challenges of doing research in prehospital medicine. The main results of the Head Injury Retrieval Trial have now been published on-line in Emergency Medicine Journal. We have paid the open access fees so that the results are freely available to everyone in the spirit of FOAM. This was an important study that was eagerly awaited by many clinicians around the world. The summary from my point of view as the chief investigator: an enormous opportunity wasted. It is now nearly ten years since we commenced recruiting for the trial in May 2005. Significant achievements include obtaining funding for a trial that was ultimately to cost 20 million Australian Dollars to run. I am not aware of another prehospital trial that has come anywhere close to this. Hopefully this is a sign that prehospital care is now seen as worthy of the big research bucks. In the subsequent ten years world events have helped to drive increasing investment in prehospital trauma research, particularly conflicts in Iraq and Afghanistan and the perception that there were many preventable deaths. The US government has become a big investor in prehospital research that might lower battlefield mortality. The Brits on the other hand typically made some assumptions based on the evidence they had and got on with it. Higher levels of advanced interventions during evacuation as exemplified by the British MERT system in Afghanistan seem to be associated with better outcomes but the evidence is not high quality. I am the first to acknowledge that randomised trials are inherently difficult when people are shooting at you. Most prehospital care is not quite that stressful but there remain significant barriers to conducting really high quality prehospital research. Taking the evidence you have and getting on with it is a practical approach but it is not a substitute for meticulously designed and executed high quality studies. Such studies often disprove the evidence from lower level studies. We all bemoan the lack of good data in prehospital care and recognise the requirement for better research. The Head Injury Retrieval Trial taken in this context really is an opportunity wasted. There is a strong signal in the as-treated analysis of unconscious trauma patients that there is a significant difference in mortality associated with physician prehospital care. The Intention to treat (ITT) analyses was not significant however. The potential reasons for the lack of difference in the Intention to Treat group is really best appreciated by looking at the difference in intervention rates in Table 2. Both treatment teams (additional physician or paramedic only) could intubate cold so we only report the rate of drug assisted intubation. This was by far the most common physician only intervention, and the one we have been suspecting to make the most difference to head injured patients. When you look at the rates receiving this intervention it was 10-14% in the paramedic only group due to the local ambulance service sending their own physician teams in a good percentage of patients, compared with 49-58% in the treatment group. If this really is the intervention that is going to make the difference, our chances of demonstrating that difference are not great unless the treatment effect is absolutely massive. The Ambulance Service in NSW decided two and half years into the trial that they considered physician treatment to already have sufficient evidence to make it the standard of care. They partially replicated the trial case identification system to enhance identification of patients that they believed would benefit from dispatch of a physician (there’s more detail in the HIRT protocol paper). This is not the first time that such a thing has happened. In the OPALS study of prehospital advanced life support in Canada in 2004 the original study design was a randomised trial (Callaham). It was however done as a cohort study owing to the belief of paramedics that it was unethical to withhold ALS despite absence of proof of its efficacy. We bemoan the lack of evidence but belief in the efficacy of established models of care make gathering high quality evidence impossible in many EMS systems. NSW has proved to be no exception. Sydney remains a good place to do this work of course. “As shown by the HIRT study, physician staffed retrieval teams are now an established component of standard care in the Sydney prehospital system. The opportunity to answer the key hypothesis posed by the study in this setting has therefore been lost and recommendation of another trial is not justified. Future trials of HIRT type schemes will therefore need to focus on other settings such as other Australian jurisdictions, where physician staffed retrieval teams are currently not a component of standard care”. The only jurisdiction in Australia with enough patients to make such a study viable that does not already use physicians routinely is Victoria. Such a study would be particularly interesting as the recent randomised trial of paramedic RSI from that state found absolutely no difference in mortality, the area where the HIRT trial indicates there well may be a difference. Any potential trial funder would want some certainty that history would not repeat itself in the standard care arm however. In NSW though, the question of whether physician care makes a difference to patient outcome is now a moot point. It is now the standard of care – HIRT has definitively demonstrated this if nothing else. All we can do now is determine the best way of providing that care. We have more to publish from the data set that provides significant insights into this question so watch this space. ….I am no doubt being dense here. If, as you say above, “the question of whether physician care makes a difference to patient outcome is now a moot point. It is now the standard of care – HIRT has definitively demonstrated this”…then will ARV make a switch to physician-lead teams? Or is it the intervention itself. Not paramedic vs physician, but robust, protocolised, audited drug-assisted early RSI (first-pass success without hypotension/hypoxia) and subsequent neuroprotection that is important? My comment is NSW specific. The NSW Health system has decided that physician care is the standard that they are going to implement. The aeromedical (rotary wing) reform plan that was released by the NSW Ministry of Health specifies that all helicopters will move to standard doctor/paramedic crewing for prehospital missions. There were several services in NSW which were paramedic/paramedic staffed for prehospital missions but that is now changing. Whether ARV also decide to do this depends on their reading of the literature. So far there are a number of cohort studies (quoted in the references) along with observational level of evidence data from the HIRT study that physicians decrease mortality and/or morbidity in head injury patients. Victoria is the only state in Australia where the question could realistically now be tested as they dont use doctors currently and certainly have the numbers to run a meaningful trial. We cant do this in NSW as the policies of the Health system now make the question untestable. IMO was never a fair fight. Is the benefit to be found in the provider, the vehicle or the procedure? If you truly postulate that physicians make all the difference, then the study design should have been physicians in road ambulances restricted to cold intubation … or paramedics in helicopters with RSI. I can accept helicopter access/speed, I firmly believe in facilitated intubation, but I am sceptical that physicians (and no-one else) can provide this care safely. There is the opportunity missed. Yep dp, I too wonder if its the procedure not the person….based on observational studies, how do WA paramedic-helo and Vic paramedic-helo teams doing drug-facilitated RSI compare with physician-helo teams? Is it the person? Or the intervention? Interesting conversation. I think we probably have to remember the context the study started in – standard paramedic care was an option, advanced care only deliverable by teams incorporating docs in NSW at the time. Alan’s comment is making an example of drug-assisted intubation as the most commonly performed intervention different between the groups because it is easy to measure. But I think he’d say that this is only a marker of a set of different skills on offer (thoracostomy, ultrasound, blood transfusion etc). It’s not a trial of any specific intervention. This isn’t a trial of physician vs paramedic care. It’s a study of advanced vs non-advanced care. It doesn’t make any attempt to look at whether you can train paramedics up to advanced care successfully (surely you can if you design the training right and support it well enough??). That’s, as pointed out by dp, a different study. To look at HIRT it’s worth looking at the protocol paper. The equally important point wasn’t just advanced care but getting it there in time. Prior to the study, advanced crews were only activated after a road ambulance first assessed the patient. Adding their response time, assessment time, call to resources time, launch time and transit meant advanced care didn’t arrive for around 45 minutes in the Sydney basin (and parts of the Sydney basin are worse, as it takes 30-45 mins for a road ambulance to respond to some corners). HIRT had teams airborne in < 10 minutes. So part of the question was whether getting advanced care earlier could have an impact (because surely waiting an hour before you finally had the option of neuroprotective care in the GCS < 12 patient isn't ideal). The patients who benefited seem to have been those who received the intended advanced system as per the protocol – as in both advanced care and quickly. Not one or the other. So the message I take from it is that we can all get really excited about advanced care options, but if we don't get the tasking right quickly so those options reach the patient quickly, the benefit of extra tech etc is lost. More broadly, there's a really interesting challenge facing prehospital research. In NSW (and I think the rest of Australia) ethics committees are increasingly of the view that no interventional trial will be an option unless there is essentially zero downside risk and/or patients can give upfront informed consent. This will be a huge issue going forward. Indeed. Thanks Andrew for rising to my bait and answering adroitly. Thanks to you for engaging Tim (I didn’t particularly take it as bait per se). Your input is always so valuable. It would be nice to see research like this focus everyone’s minds on how to make tasking and triage better. The Flying PhD is right. The paper was a comparison of a package of advanced interventions against the current level of paramedic care in NSW. It was never designed to determine whether that package could be delivered by paramedics, doctors, nurses or any one else in particular. In NSW if it was going to happen it had to be doctor delivered so that is the route we went. http://www.sjtrem.com/content/20/1/82 (open access). Better indentification of patients had profound effects on the trauma system in Sydney for severely injured children. There is more data yet to be published on the systems we set up for this trial. No one is going to benefit from advanced interventions (whoever delivers them) if the patients are not identified, and the advanced intervention team cant get there fast enough. great discussion gents! Kudos to Alan and Andrew for openly discussing the HIRT trial in detail to provide perspective about what superficially comes across as a negative study with multiple methodologic challenges . The dispatch issue I had not considered so its a revealing insight in the commentary here. Its application to wider Australian prehospital care is complex to consider. I am thinking of the Fatovich study from WA on rural vs urban trauma mortality which seemed to indicate that as long as a trauma patient entered the EMS trauma system, they did fairly well despite tyranny of distance. So whether speed of provision of advanced prehospital care in trauma makes a true difference..the jury is still out post HIRT unfortunately. I bring this up as only last week I saw a news update on Senator Giffords who has made a remarkable recovery from a point blank gunshot wound to the head in 2011. Despite HEMS units on standby to respond to her wounding, ground EMS did a scoop and run strategy and got her into nearby trauma centre 11 miles away. She was in surgery within 38 min of wounding. Can I ask you Sydney folks how this would have played out in your city? Would HEMS have been sent and if so, how is the decision made to take the patient to which hospital? Which hospital is easy. They would be taken to the nearest in time major trauma service. The dispatch question I will answer in two parts; what would have happened during the trial and what would happen now four years after the trial and trial dispatch system ceased. During the trial this patient would not have been randomised as penetrating trauma was not in the inclusion criteria. Lets just say that penetrating trauma was included though and the patient was randomised to the intervention arm. If you look at the protocol paper it mentions that if the attending road crew had the patient loaded and the physician team had not yet arrived they were to depart. This is indeed what happened during the trial with only a single protocol violation that occurred in 2005 about three months after we commenced recruiting where a road crew waited for the medical team. Road teams scooping and running patients from the scene did not actually occur very often though. In >1500 incidents randomised to physician care the scoop and run rate was consistently 2% throughout the trial. If you just consider patients with significant injury it was 4% as the physician team was so fast (see the latest post) that generally the road crews could not scoop up even a non-trapped patient fast enough to have left the scene before HIRT arrived. Pedestrians in the Sydney CBD seem to have been the major exception to this. Fast forward four years and all I can say is that I think a physician team would be dispatched, but I cannot say for certain as Ambulance have not told us what the criteria for dispatching us are. At the cessation of randomisation in 2011 they inidcated that they would continue to task us to cases broadly in line with those that we had responded to in the trial. Since then they have sent us to penetrating trauma cases, but as to whether or not this is the policy I dont know. We have not been consulted on the development of the tasking critera (which is obvious I guess in that we dont even know what they are) or the current geographical separation of tasking between the two physician teams in Sydney either. This latter tasking policy seems to be updated from time to time but we only find out serrendipitously from our doctors who work in the coordination unit after the event. How they have arrived at the policy as to which cases are done by which physician team we dont know and when it changes Ambulance dont tell us. Confused? I am. If you take a look at the latest post it certainly suggests that an examination of this issue would be more than timely. Thank you for the opportunity to reply to your posts surrounding prehospital care in greater Sydney. The following represents our personal view. Prehospital research is a huge challenge but in our opinion the HIRT study question, study methodology and setting were crucially flawed. This resulted in a study which took almost 6 years but failed to recruit enough patients to definitively answer the question it posed. Rather than test the effect of a specific intervention or bundle of interventions the study intervention described in the HIRT paper was ‘standard treatment plus a physician arriving by helicopter’. Prehospital & retrieval medicine (PHARM) has evolved well beyond the assumption of physician superiority. The international PHARM community, supported by an expanding literature, acknowledges the necessity of prehospital critical care delivered by teams who have received a structured and ongoing training program, applying interventions and monitoring according to clear standard operating procedures, and whose safety and quality is assured through an open and robust clinical governance framework. No mention of specific training is given, no clinical operating procedures were available in the public domain during the term of the study, and worryingly the only standard of care mentioned is “protocols for standard trauma therapy as determined by the Royal Australasian College of Surgeons Early Management of Severe Trauma programme”, a 2.5 day ATLS-equivalent course for junior staff devoid of prehospital training. Without specific operating procedures or protocols the trial could never be replicated: an essential component of the scientific method. Without a multicentre design any outcome would inevitably lack external validity. Were there a specific set of operating procedures these operating procedures needed to have been at the core of this study. The second major issue was the study methodology. In a reversal of sound RCT methodology patients were randomised at the time of tasking (or self-tasking by HIRT) then eligibility criteria were applied resulting in data on very few patients being analysed (≈10%). Patients were excluded for a variety of reasons some of which were likely to be non-random. This intrinsically limited the statistical validity of any result whether the trial had recruited fully or not. If one had to point to the single biggest failure it was clearly recruitment with not enough patients recruited despite 5yr and 10mths elapsing in a study designed to last 3yrs. This became clear to the investigators early on and led to change of inclusion criteria while the study was underway. Why did the study fail to recruit? A significant factor was the choice of setting, Sydney NSW. Sydney has 6 major trauma centres in the metropolitan area which limits the number of patients who can be attended by any single service before they get to hospital. 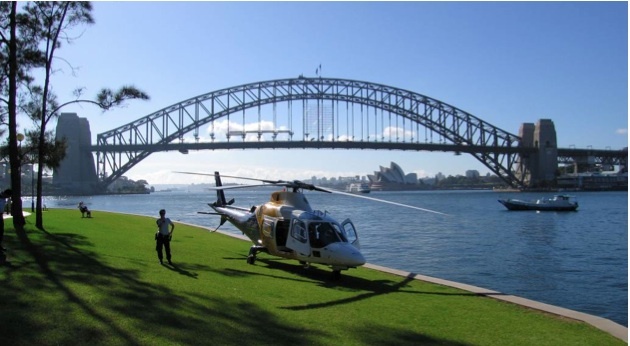 At the time of inception of the trial in 2005 there were two services providing physician/paramedic teams in the city with an ability to respond to prehospital cases (including unconscious head injuries) by road and helicopter (one half of which was run by CareFlight NSW themselves). This had been the situation for the last 25 years. Those of us looking from outside harboured severe doubts the trial would succeed simply due to recruitment issues. Indeed the trial recruited just over 1 patient every fortnight in the treatment arm to give a total of 169 patients treated by the HIRT team in 5 years 10 months. There is the suggestion that a cause of the failure of the study was cross-over ie patients treated by “standard” physician/paramedic teams. Over the almost 6 year period the study paper identifies 30 patients (≈5/year) which puts this suggestion into perspective. It is also suggested that cross-over became an issue because NSW Ambulance introduced a role called Rapid Launch Trauma Co-ordinator (RLTC) “replicating” the HIRT case identification system. Any one working in HEMS in NSW knows this to be untrue. The RLTC is a position within the Aeromedical Control Centre designed to find patients in rural, remote and outer urban fringes of metropolitan areas distant from Major Trauma Centres who would otherwise be subject to delays in advanced care due to geography or because of entrapment. They task any one of 10 helicopters or road teams around the state. NSW Ambulance went to significant lengths to avoid interfering with the HIRT Trial. That the cross-over remained so small is testament to the different targets for case identification. No HEMS system would wish to “replicate” the HIRT case identification system considering the very high call-off rate (approx 3 taskings for every patient.) Self-tasking of helicopter EMS carries significant risks to crew and the general public which can not be tolerated in mature systems. Subsequent sub-group analyses reported as “studies” are merely observations of non-random data and use surrogate markers of “performance” such as “time-to-CT-scan” and fail to refer back to the original trial primary outcome showing no evidence of benefit. There is inadequate comparison of complications or adverse events (ie inadequate pre-oxygenation, episodes of desaturation or hypotension post RSI, multiple intubation attempts, failure to decompress pneumothorax etc…) encountered in the haste to “stop the clock” by moving from scene, especially as the rate of urgent surgical intervention in blunt major trauma patients is very low. “Analyses released subsequent to the Final Report were not pre-specified in the statistical analysis plan and suggest lower mortality and morbidity risk for patients managed by physician staffed retrieval teams overall, and specifically for road trauma patients. However, these significant findings resulted from comparison of non-randomised groups. As patients who changed treatment allocation groups after randomisation differed significantly from patients who remained in their allocated group, the findings are likely to be biased, and should be interpreted with considerable caution”. The follow-up from Dr Garner was so long it seemed better to give it a new post, hence the link.